Books and words, boys and girls. | An alien voice under a duvet of dreams. 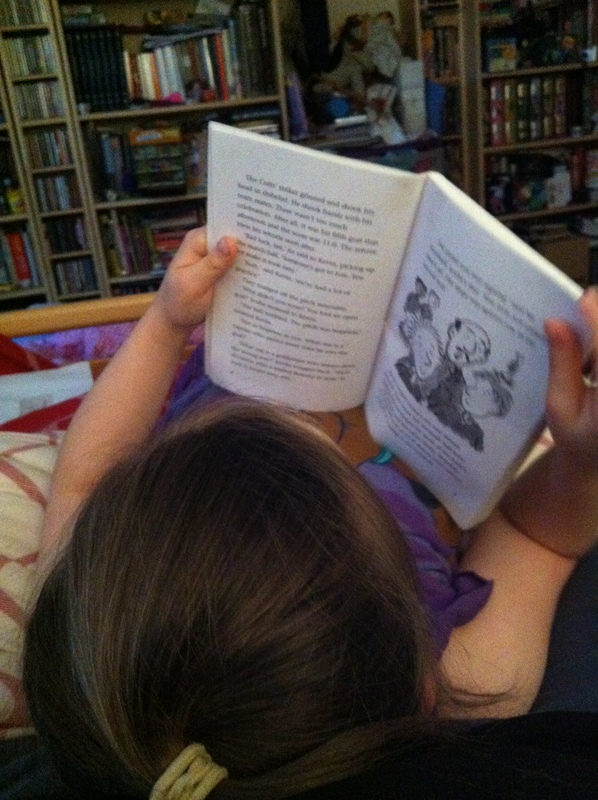 Posted by phoenixaeon in books, Children's Literature, Parenting, Reading with Principessa. Well. I never, ever imagined I’d be one of those parents who complain about what their kids are reading. After all, they’re reading, right? Okay, yeah, they’re reading and that’s a good thing, but have you ever looked closely at what the schools send home with the kids to read? No? Maybe it’s worth a look. Princi’s school uses the Oxford Reading Tree system. This breaks up the experience of learning to read into various stages aimed at particular years/grades. It’s a good idea, as long as the kids aren’t held back if they show a knack for reading – as Princi was last year. Her teacher knocked her down two stages at the beginning of the year despite Princi reading competently at the higher level at the end of the previous school year. Anyway, that’s not my problem with this system. My problem is that it’s geared more towards ‘reluctant boy readers’. With the books being sold in sets of six, the ratio of girl:boy related titles is a maximum of 2:4, meaning that most books in the series are primed for male readers. Okay, so girls are more likely to read books centred around boys than a boy is likely to read a book centred around girls, but this doesn’t negate the fact that the boy’s books are all about adventure and football, while the few girl titles are set around flirty girlie love stories or kittens or kitchen maids. And another worrying thing is the representation of parents – especially mothers. They are seen as incompetent and useless parents, especially the ones who are portrayed as working mothers. It’s a case of ‘oh, you’re such a bad parent! You’re out at work, the washing machine needs fixing, and you have to leave the older kids to look after the younger kids. Isn’t it lucky you have a boy in your family who has a knack of fixing machinery!’ It’s all ever so slightly dubious. And then we have a story, a retelling more like, of Sleeping Beauty. It’s almost adventurous, except it’s another boy’s title. And the first characters you meet are two male ‘fairies’ trying to find a suitable prince to awaken Princess Aurora. It’s a feminist field trip, I tell you! But just like a reluctant boy reader, the main character – the typical messy boy, but with atypical sensitivities due to being the outcast – is also reluctant to kiss the princess. But kiss her he does after an aggressive Fairy Godmother frog marches him to the princess’s castle. So now we have a role reversal, the sensitive boy vs. the selfish and tactless princess. Yes, it’s a Beauty and the Geek moment. By the end of the story, the charms of the boy have subdued and controlled the snippy behaviour of the girl, but that’s not all. To protect her ‘inheritance’, the princess more or less has to sell off the land around her castle to be developed into an amusement park while selflessly sharing her wealth with the boy. Oh, talk about sexual metaphors and harking back to eighteenth century relationship ideologies! Or maybe the problem I have with Princi’s school reading is just me. Maybe I’m thinking too deeply about this. Maybe I shouldn’t be worried about the books Princi is forced to read as part of her ‘learning’. But to me it feels like girls are getting a little bit of a raw deal, something that has to be rectified at home with books about strong female characters who are adventurous and sensitive to others at the same time, rather than being the secondary character and reader to a system which appears to be geared towards encouraging boys to read.